My first thought when hooking the Intruder up, was that this thing was a BEAST. And I mean that in the best possible way. No matter what was played through other portable amps, when played through the Intruder, there was a complete higher plane represented. And yes, I know that this could be the louder volumes, but when I sat back and analytically listened, there was a crisper presentation to my music, there was more “volume,” aka 3D presentation. Not holographic like the 3D+ on an iFi, but just filling a bigger space, without losing density. This can be hard to do…one can get a sense of that added volume but lose what you are trying to gain in density. There is no such loss in the Intruder. Playing Lindsey Stirling’s Elements is an excellent example. The song is already wrought with a full orchestral sound, willingly bounding into the walls of said space, but not getting mashed up upon return. Add the Intruder into the mix, and there is a stronger rebound impact of that sound back to me. 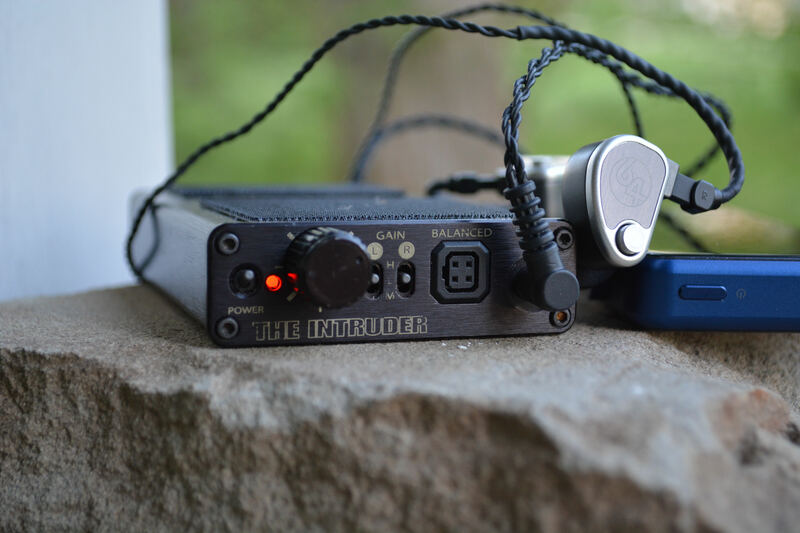 I have not felt this way about an amp (portable, and of course excluding the Apex Pinnacle2) since my neophyte (still am…I’m pretty bad at this stuff) days with the iFi Micro iDSD Black Label. That holy buckets this is good sh*t type of stuff. I have/had done a good bit of reading up on the Intruder before and during my time…and some make light of the price, and the why should it cost so much, going back a few years…Well, I can say that based upon that “historical bantering,” the Intruder is as timely now as it was back then. Full-on balanced (with proprietary 4-pin square cable jack) in/out, a 3-way gain setting (be VERY careful when switching up…yikes! ), USB in as well as coax, and power for the hardest to drive critters make this a timeless classic. Thinking back and if one had invested the kind of moola this critter cost, one would STILL be at the forefront of portable amps, albeit without Bluetooth (big deal…). This is an investment, not a “flavor of the month” purchase. And one, I could see trading a whole host of gear to obtain. I do not say this lightly. I am getting the kind of bass punch I do by switching the Bass Boost switches on my other portables…without a bass switch. I will add quickly that there isn’t the punch of bass had by those boosted amps, but the control presented through Tidal and my MBP/Intruder/64Audio U8 is impeccable. While not the best I have had the honor to hear, this is one kick arse set up. And if one goes portable, the set-up of choice (for my testing the Shanling M3S, and Opus#2) would shake the pavement with quality not often heard in public. And if so, often with more bling than this…to some an undesired quality. For this my dear reader, is about as plain black a looking box as it gets. And I LIKE it that way…I have always preferred stealthy-looking critters, and this is about as under the radar as it gets…simply splendid. Needless to say, the critter in Q is superbly built. 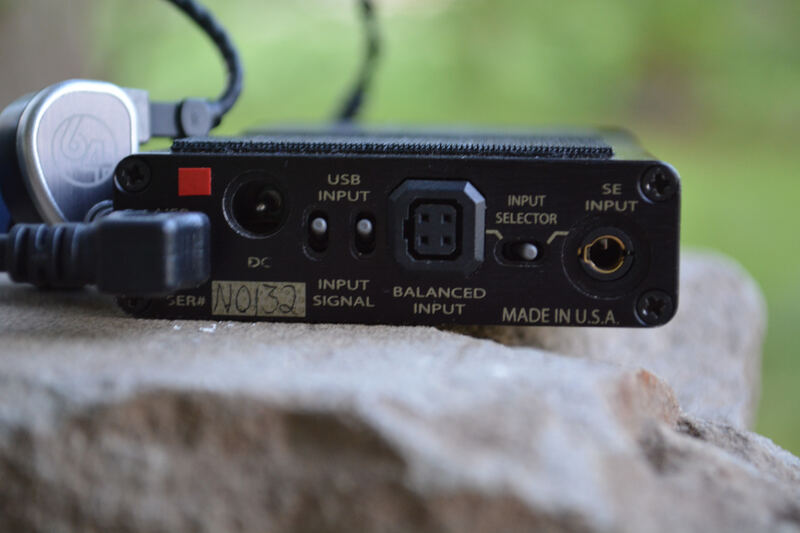 No flaws, no loose jacks, no switches, which might function less-than-worthy of a $700 portable amp. I will state that the gain switches are a might bit hard to get to, as they are in very close proximity of the volume pot. And, if I must niggle, after leaving the amp for a day or three; the volume pot was a bit slow to turn. Almost like me getting out of bed after refereeing 6 Futbol matches the previous day…it can be excused. And I do like the solid feel of the wheel. Solid and without too much pressure. I prefer a tighter fitting knob, so any “misplaced movement” of hand does not result in a trip down French Church bells ringing on one’s head from the sudden volume increase. Suffice to say, the industrial look rules here, and that is OK in my book. I would not purchase this for aesthetics, but for performance. I do prefer a critter that is understated and lets the performance show. Think 1992 Mazda Protégé, and Auto-crossing and you get the picture…A family sedan by week, an autocross winner on the weekend. Every note heard from where the musician intended. Every beat perfectly tuned an in tune with the song in question. Dave Brubeck’s Thank You first puts you right over the Pianist’s shoulder, then tapping with the drummer’s sticks on cymbal. Then the sax solo takes up you front; to be quickly wrought to the side hearing the finger pluck of the bass. And back to the pianist shoulder. Just marvelous. To think that this amp is about 7 years old or more in design and sale is spectacle at the quality wrought by the company. I read a lot about how the Intruder “overpriced” or “not worth it” or “are the F-n crazy with that price??! !” Let me just lay that to rest right here and now. Even with my multitude of portable amps, this would be the one so far that would make me sell all of my others to fund this one. I would keep the iFi xDSD for its Bluetooth capabilities, and because it is a darn fine amp, too. But I would replace my balanced amp for this one. I would. 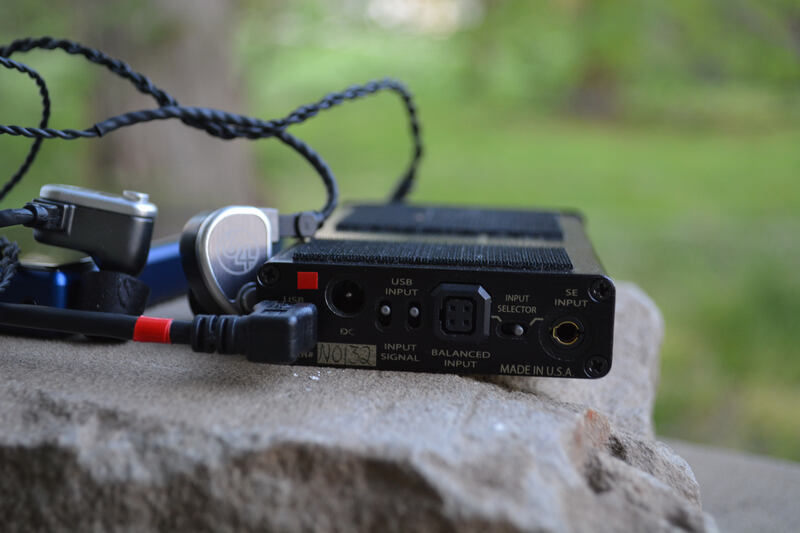 Running the Shanling M3S on volume 40, and the Intruder’s gain on Medium, I was overwhelmed by the musical nature of the amp. A full, deep reach of bass, coddled by mids, which neither shone over or subservient to the treble and bass. And treble, which to my tired old ears was just about perfect. A good reach, high of pitch when the song was recorded that way, less dominant when the song was recorded that way…an honest representation of sound, with very good sound stage would be my best descriptor…Superb is really an insult as this was MEANT to be that way. Everybody’s Jumpin’ by Dave Brubeck is another audition where any fallacy of sound could be the death, or at least downfall of a lesser quality piece of kit. Honesty was what I heard, and honesty was what I wanted from the Intruder. I marveled with the representation of Tidal through my MBP and the iFi Mercury cable interconnect. Yes, I know it is only Tidal, but to my ears I very much like the sound anyway and to add the Intruder into the mix, was a joyous occasion, indeed. I would put the above-mentioned songs on almost par through Tidal and the MBP as I would the M3S and the included interconnect cables…almost. The sound through Tidal has that artificially added bass push, which seems to muddy the sound more through the Intruder with rumble, but not so much that I cease to enjoy Car Radio or Heathens or Ride through the Intruder/MBP/U12t. A lucky listen with much appreciation from the two companies of which I borrow the equipment in question. 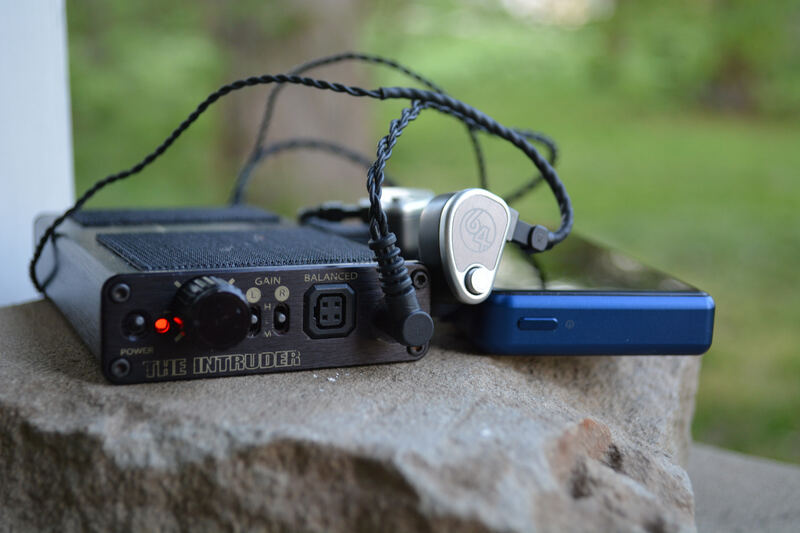 Compared to the iFi BL, the RS has better overall control of the sound. 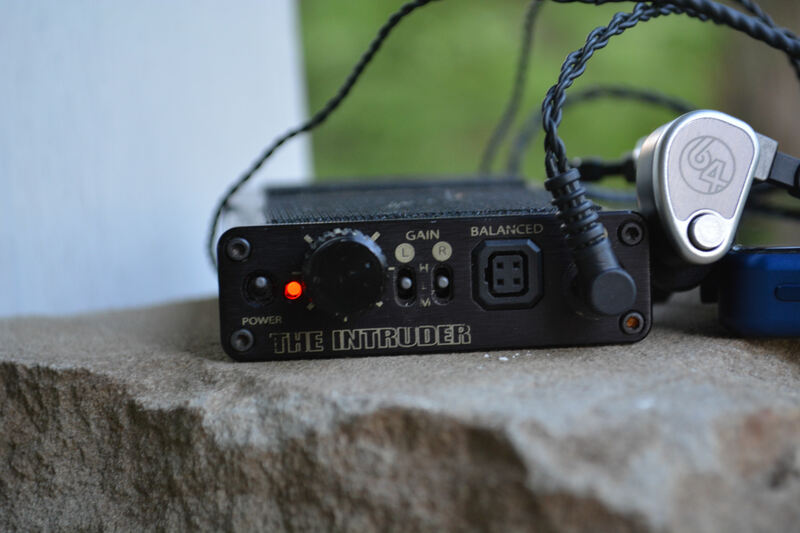 Without the “too bright” treble I hear from the BL, the RS again betters a current amp I own without having the bells and whistles of my personals. That said, I can use the XBass and 3D+ to my advantage between songs and genres better than the Intruder. But, there is nary a genre where the RS does not function well let alone, flawlessly. I really, REALLY like my BL, so for something to come along and make me think twice about selling it in order to fund another says something indeed. But, through all of this I am content with what I have but think of the Intruder. Happy with what I have makes me appreciate the Intruder more, knowing I have been a guest in its house for a good listen. The BL is good, very good; but the Intruder is better. I’m not sure what else can be said about the RS Intruder, that may convince you to either splurge and get one, or to look for a used one, other than to audition one if possible. I thoroughly enjoyed the extended stay in my house. The Ray Samuels Intruder was an honored guest welcomed by all other amps, knowing that they were indeed in the presence of one of the founding members of high-end portable amps, and indeed royalty. I want to that @Howlin Fester for the extended borrowing of the Intruder. I overstayed my welcome with it, and for that I apologize but will be eternally grateful. Maybe one will find its way into my humble abode. It would be welcomed.